Single Tooth Replacement - When you have one tooth missing, a single implant is inserted into the bone to replace the root part of that tooth, a crown goes on top simulating an actual tooth. This treatment has the highest success rate making it the best long-term investment for replacing a single missing tooth. While the initial cost is slightly higher than other options, it is the most cost effective option over time. 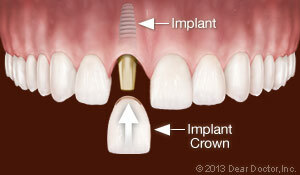 An implant will never decay or need root canal treatment and feels just like the tooth that was there. 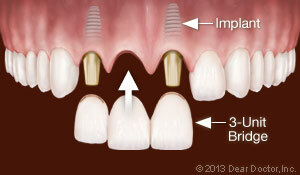 Multiple Tooth Replacement - When more than one tooth is missing, implants can provide an ideal replacement option. You don't need an implant for each missing tooth. For example, if you are missing three teeth in a row, two implants can be placed and a bridge made to replace all three teeth. Replacing All Teeth - Fixed Dentures - Implants can support an entire arch of upper or lower replacement teeth that are fixed into the mouth and are never removed. 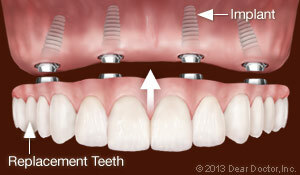 Sometimes, the new teeth can be supported by as few as four implants in an arch. It's comparable to the structure of a table which only needs four legs to hold it up. In cases where jawbone density and volume have deteriorated, five or six implants might be needed to support a row of ten to twelve teeth. 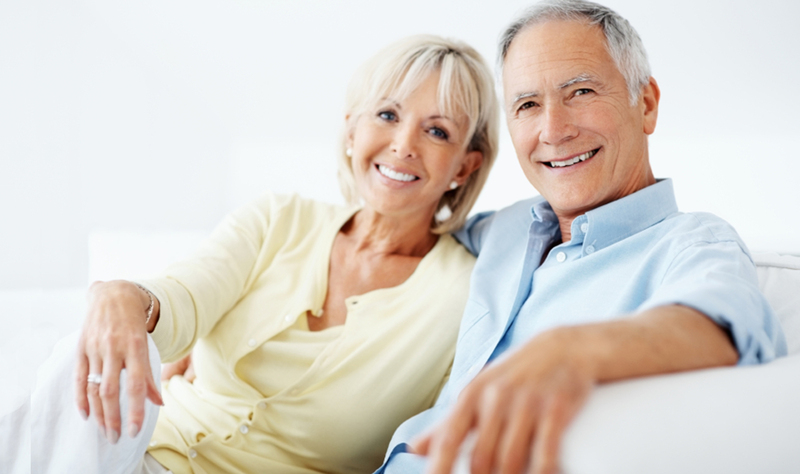 Removable Dentures - Implants can make removable dentures more comfortable, functional, and healthier to wear. Traditional dentures rest on the gums and put pressure on the underlying bone. This accelerates bone loss so that the jaw shrinks and the dentures slip, particularly on the lower arch. Today, removable dentures can be placed on implants, transferring that pressure into the bone rather than on the bone surface. This prevents the denture from slipping while you eat, speak and preserves the bone under the denture.